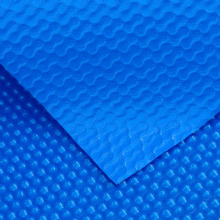 A range of different heat retention cover materials in popular pool sizes. If your pool size isn't listed, or is an irregular shape, please contact a member of our sales team on 0343 289 4464 or email us for a quotation tailored to your pool. A high quality 500 Micron Heat retention cover featuring a grey top surface and a black underside designed to reflect more heat and offer a greater level of heat retention. 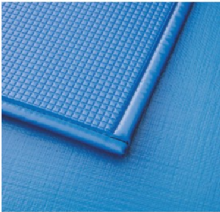 A high quality 500 Micron Heat Retention cover featuring a light blue top surface and a black underside. Designed to reflect heat beaming down onto the cover, to help keep your pool cool in very hot climates. 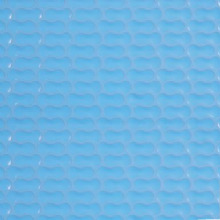 This cover contains a UV Stabilised bubble material co-extruded onto a woven top sheet. 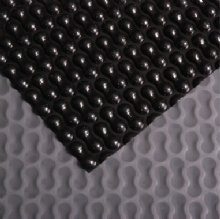 A high quality 8mm polyolefine closed cell foam cover. this Premium cover has a tough woven top and bottom sheet for heat retention and strength. 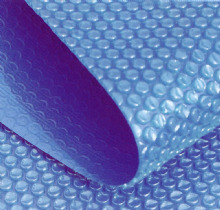 A high quality 5mm polyolefine closed cell foam cover. this supercover has a tough woven top and bottom sheet for heat retention and strength.